The Loop pointer lets you control your computer without the constraints of wires or surfaces. Time to get animated. The so-called "air mouse" that supposedly lets you control your laptop and, thus, your sales presentation from anywhere in the room is a tech concept that never really gelled. Giving a successful presentation using it is kind of like trying to eat a pea with two knives: It's possible, though clumsy and not very satisfying. But the Loop pointer ($99 from Hillcrest Labs of Rockville, Md.) puts a new spin on the idea of air control. By employing the simple principle that a large ring is easier to hold and manipulate in open space than an in-hand mouse, the Loop brings a level of ease of use and sensitivity to controlling a PC from a distance. Besides looking like no other mouse on the market, the Loop allows for legit two-button, right- and left-click control of a PC. 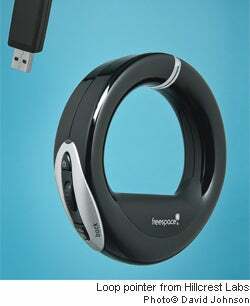 That means you can open documents, surf the web and even launch videos as you would with a typical, desk-bound mouse. Getting the hang of the Loop can take some time, but the unit gets high marks for overall design, layout and construction. And you should find that controlling your PC, while not nearly as easy as using a table mouse, is much more subtle than existing control peripherals that don't need a hard surface. So if you're looking to add some zip and a wider range of motion to your next sales pitch, give the Loop a whirl.